Successfully Added Allocacoc EU PowerCube Travel Adapter - DE Original USB Travel Socket, 4 Outlets, 4 Adapters for US, EU, UK, AU to your Shopping Cart. It’s often the seemingly small things that make all the difference in how our lives are organized. A simple compact plug can make lots of things in your life more efficient and give you the piece of mind when traveling. The Allocacoc PowerCube is all you need to plug in any of your devices no matter which part of the world you find yourself in. So, if you are a frequent traveler and often have to deal with the headache of finding a way to plug in your laptop or phone charger abroad – these troubles are a thing of the past. 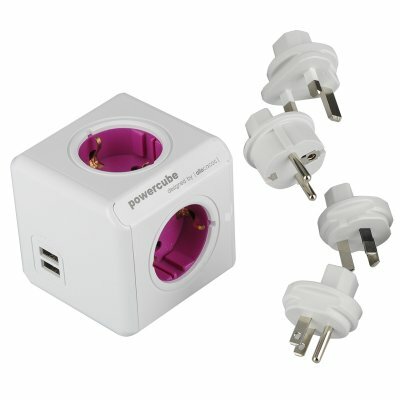 The PowerCube Rewirable comes with 4 adapters that will allow you to plug in your gadgets in some of the most popular destinations of the world: USA, Japan, Europe (including UK), Australia and China. As most accessories by Allocacoc, the PowerCube Rewirable features well thought-through design and additional functionality. Despite its small size, the power outlets on the Cube are arranged in such a way that the power plugs won’t block each other or get in the way. What’s more, with the two USB ports on the side, you will be able to directly charge small electronics, like Smartphone’s and tablets, without taking up an outlet. The Allocacoc PowerCube comes a standard receptacle and can even double as an extension cord, letting you finally make use of all the old cables you may have lying around. All in all, with the Allaococ PowerCube you have yourself a compact, multifunctional and practical accessory that can get lots of trivial hassle off your hands. The Allocacoc PowerCube Rewirable comes with 12 months warranty. Brought to you by the leader in electronic devices as well as wholesale travel adapters, Chinavasion..